Hi, I need the manual for installing alarm.. can anyone help me out? thanks bro! EDIT: If you know what sections of the manual you need, I can copy them for you. There is also a shop manual available on CD on eBay for a few bucks, but I don't know if it is a good as the hard copy available from Mazda. It does have a wiring diagram, though. Last edited by Go48; 01-04-2005 at 06:09 AM. Thanks alot Go48!! 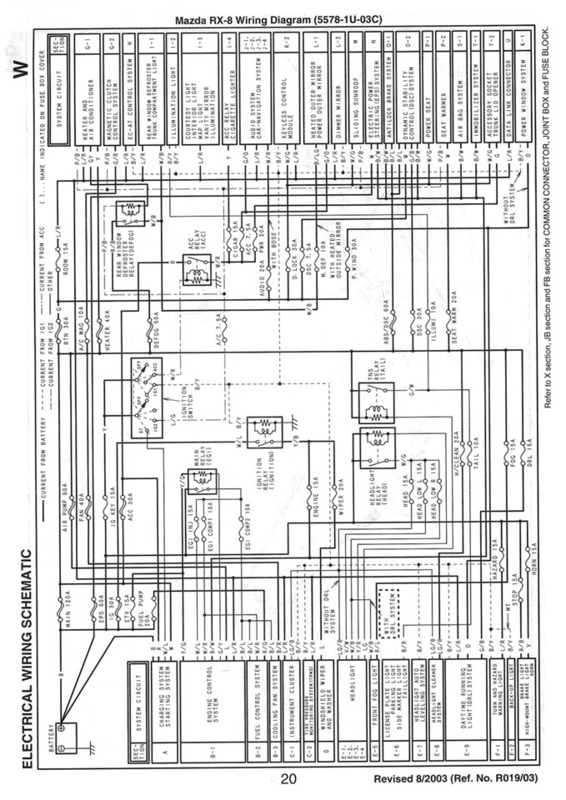 basically i need the diagram for all those small cables under the steering wheel.. do u think u can send me a copy? that would be very nice! thanks alot bro! Unfortunately, the wiring diagrams don't work that way. They are all schematics with the individual diagrams associated mainly with particular devices or systems. So there is no diagram for wires in a specific place in the car. I will attach an overall diagram that may or may not be of any use. you've done so much!! thanks alot bro! OK, save me the task of figuring out what IAT stands for and I will copy the appropriate diagram. 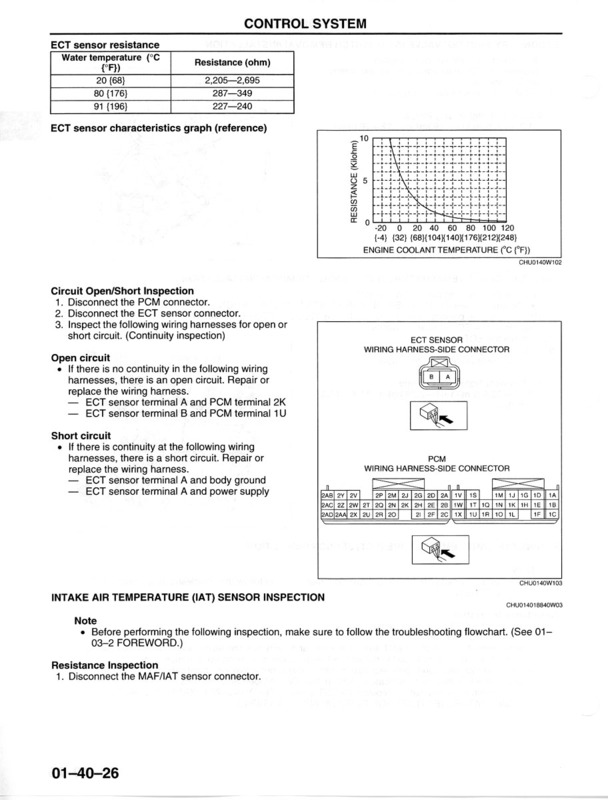 The wiring diagram does not show the IAT per se, but according to my interpretation of the section on the MAF system, the IAT is a part of that system. So, I have attached the wiring diagram for the MAF and the diagram showing where it connects into the PCM. 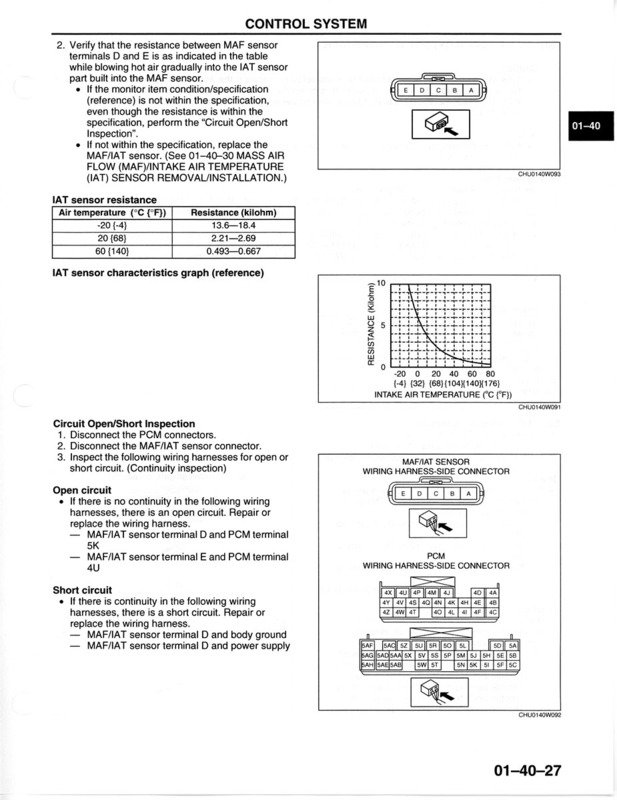 I have also attached the 2 pages in the shop manual that lead me to believe that the IAT is integrated into the MAF system. Good luck with your project. 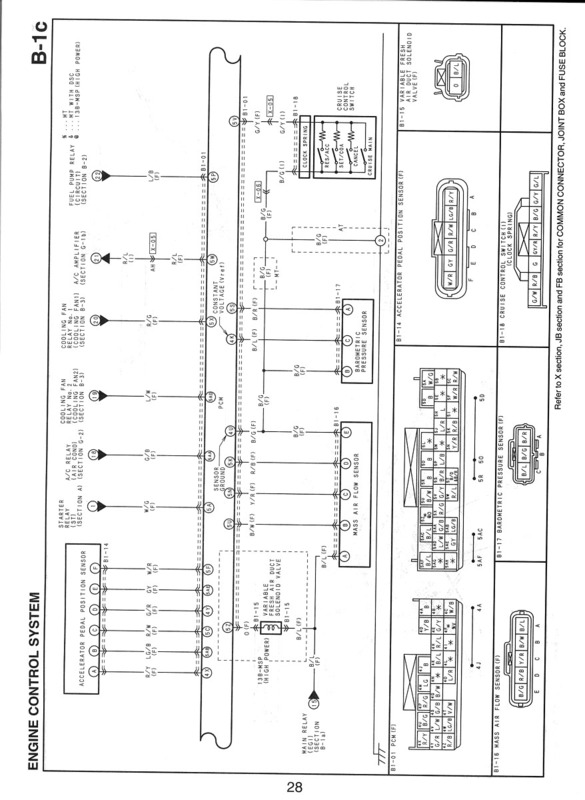 Hey Go48, the wiring diagram is realli cool but do u think that u can make it bigger and easier to read? thanks alot bro. The size of an attachment to a posting in this forum is limited to 200KB. So it will not be possible to send anything through this forum any "larger" than what I sent. If you want a larger image you can copy the image from the forum to your HD and use an image viewing program to enlarge and rotate the image. As an alternative, send me a PM with your e-mail address and I'll send you a higher resolution and/or larger physical size of the image. 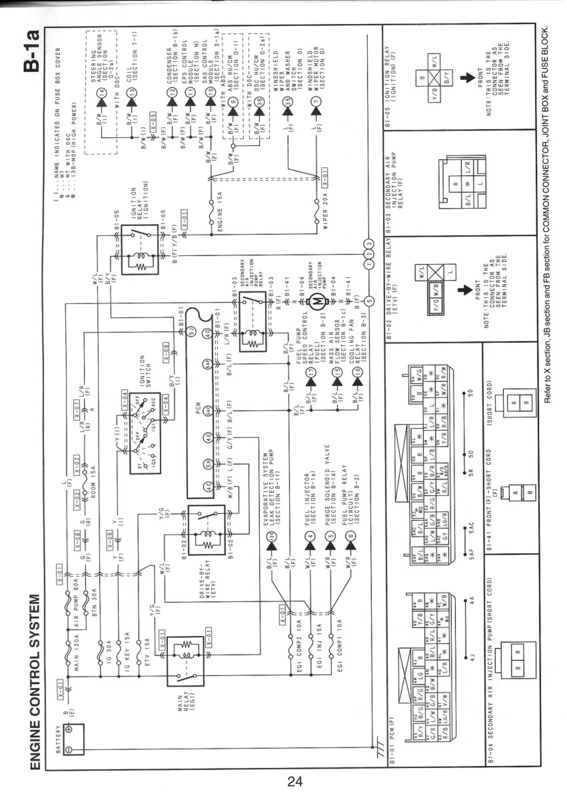 If anybody is reading this and looking to install an alarm/remote start/etc, don't suffer sorting through all these schematics. The KCM (Keyless Control Module) is above the passenger kick. The PATS ignition is black/white in pin D, and ground is black in pin C.
The PCM (Powertrain Control Module) is in the passenger side front corner of the engine compartment. Last edited by firebirdude; 09-29-2014 at 06:54 PM. Hello all, My apologies if this is the wrong thread. I have problem with starting the car as I turn on the ignition key the car boot automatically opened and the alarm sounded with no cracking of the engine. I suspect this could be a wiring issue. I hv just picked my rx8 back for engine replacement to rx7 engine with turbo. Any good pointers are very much appreciated.Tqvm. Sounds like you need to take it back to the shop that did the engine swap. No crank, but tripping the alarm MIGHT be a dead/low battery. But I've never heard of a low battery popping the boot. Also, if you have one, try a different key. It's possible the transponder inside the key went dead. In which case, the car wouldn't start and the alarm would be triggered because it thinks the car is trying to be stolen. Again, haven't heard of this popping the boot. Yep. Tried changed to a new battery.. Same thing.. Boot popped out when tried to crank the engine and the alarm went off. I only had one key! Already contacted the mechanic but he is away in Japan and only be back next tuesday. Speaking of being stolen, good thing with fB, news spread like wildfire... found my wife's stolen car at the workshop for repair.. Went thro' a lot of hassle and eventually bringing in the cops to take the car away ( Appreciate for yr trying to help. Someone in an attempt to steal or damage my car, cut some cables beneath the steering wheel of my manual RX-8. the first picture shows the plugs, right next to the brake cable. the second picture shows the cables that lead to the brakes. the third picture shows the cables right above the gas pedal that leads to this brown box. Could someone who knows these things, tell me, which harness I should replace. Is it the "under dashboard" harness or does it have to do with the engine harness? Please help a fella out, I am totally dissapointed! I did it but insurance companies are non-existent and low-quality in Europe. I wonder if someone knows which harness replaces all those cables. I would be grateful to him! That's all on the main harness...the engine harness is all in the engine bay.